Did you see that there’s a new kind of Whisper White Thick cardstock in the new Stampin’up catalogue (p.149)? I think this is a great addition to the “traditional” Whisper White card stock. The Thick Whisper White cardstock is perfect to make card base. Before, I never used Whisper White cardstock for my card base because I found it was not sturdy enough. But, this one is made especially for that! I still use the regular Whisper White cardstock for all my other layers that are added on my card, so it doesn’t make it too bulky. For this card, I made my card base with this new Thick Whisper White cardstock. 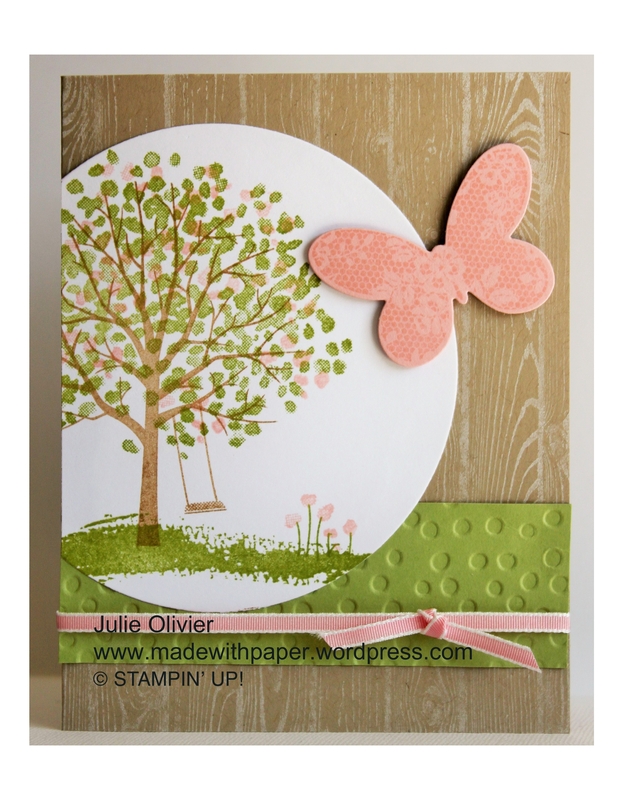 I used the beautiful “Sheltering Tree” stamp set. 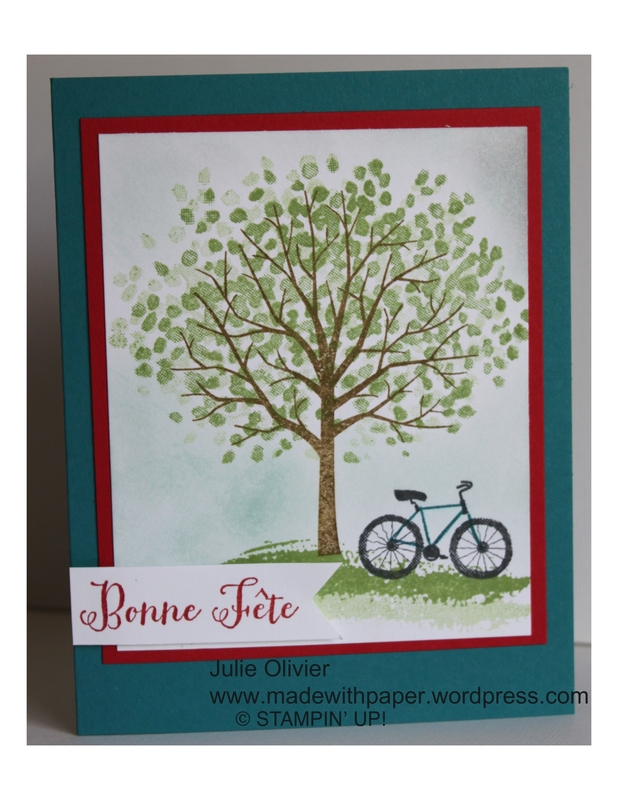 The tree leaves were stamped on my card base and then on my outlined image. I’ve seen that done on another card on Pinterest and I thought it was a brilliant idea! Overall, this is a simple card but I think it has a nice refreshing look! I wanted to make a set of cards as a thank you gift for my children’s teachers. 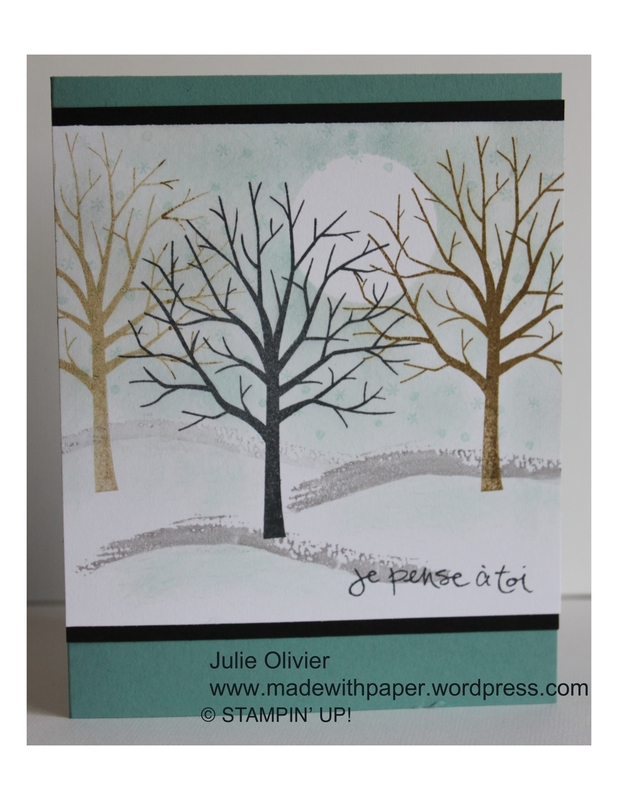 I decided to make 4 cards with the super nice stamp set called “Sheltering Tree”, one for each season! Here’s the cards I made… Which one is your favorite? The Winter card was cased from Carrie Rhoades at http://www.carriestamps.com. I’ve been away for a while, busy with life!!! The end of ski season was really busy with my kids in ski competition! 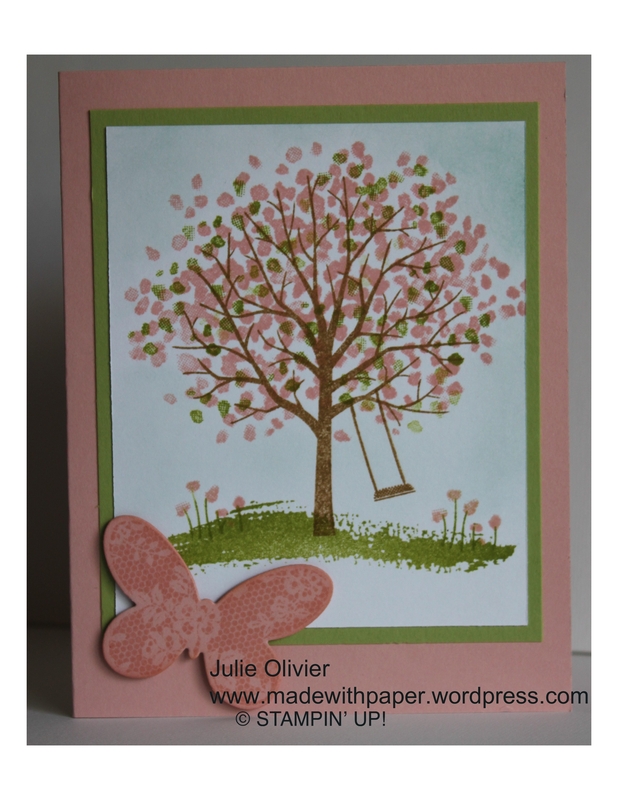 I have a perfect “Spring” card for you today. I made it with the new “Sheltering Tree” stamp set. I love that set because you can change the tree to fit any season! I also used the Butterfly from my favorite set called “Butterfly Basics” that also have matching Thinlits and beautiful detailed Butterflies! For the background, I used the “Hardwood” background stamp, with White craft ink. 1. Cut half a sheet of Crumb Cake card stock (8.5″ x 5.5″). Fold in half to form the card base. 2. 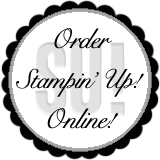 Ink the Background stamp “Hardwood” with White craft ink and stamp on the card front. 3. Cut the biggest Circle from the Circle Framelits in Whisper White card stock. 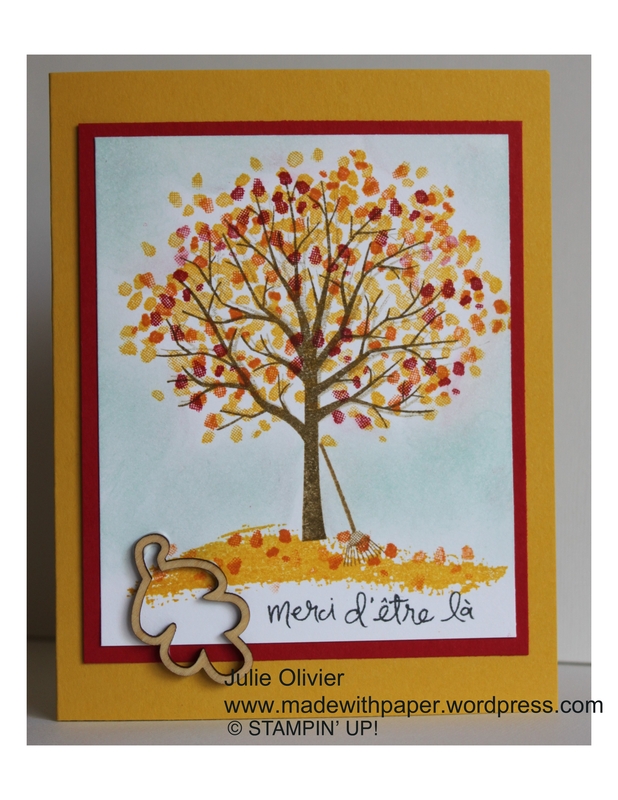 Stamp the tree with Baked Brown sugar and the leaves with Pear Pizzaz ink. Stamp little leaves on top with Blushing Bride ink. Stamp the grass and little flowers with the same colors. Trim the left side of the Circle. 4. Cut a 1-1/4″ Strip of Pear Pizzaz card stock. Run through the Big Shot with the Decorative Dots folder. Wrap the ribbon behind and adhere at the back with Snail adhesive. Tie another small ribbon on top. Adhere on the card front. Adhere the Circle on top. 5. 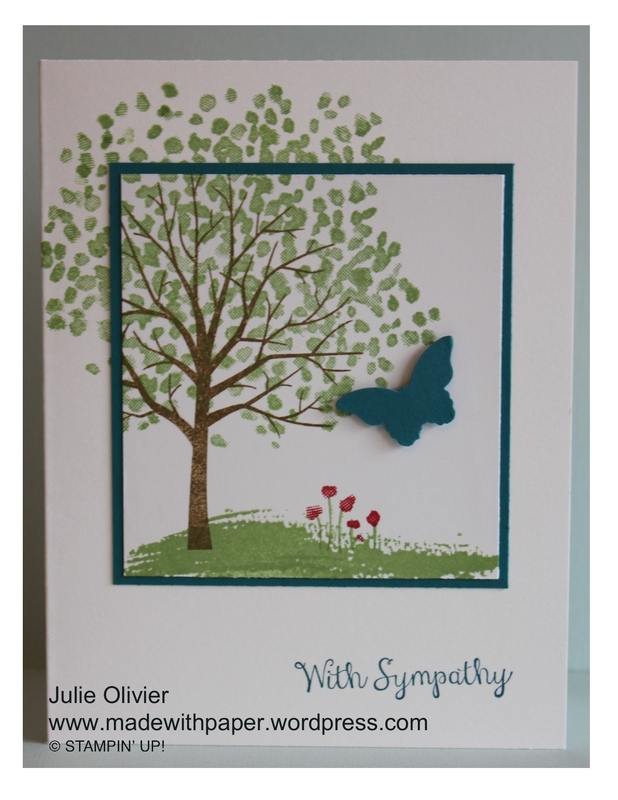 Stamp a butterfly with Blushing Bride on Blushing Bride card stock. Cut with the matching Butterflies Thinlit. Adhere on the card with dimensionals.